It's been a long time since I made one of these quilt cards and I was prompted to do so because I wanted to update my "quilt ring" of DSP's that help me with the colors that co-ordinate them them. While I do like pulling out my catalogue, it's much easier to look at the top-note quilt and check the back where I put the information of the DSP, i.e., catalogue, number, cost and co-ordinating colors. More Mustard is one of the co-ordinating colors from the Spice Cake DSP in the Holiday Mini, so I used that as the base card. The front is textured with the Perfect Polka Dots Embossing Folder and the top note quilt is popped on the front with dimensionals. The medallion is made with our new Simply Scored Scoring Tool (a must have!). The centre of the flower is a Build a Brad. This is the ring that I use to hold my samples. I have to admit I have been a bit lax in the the past while and need to add more to it. On the back is all the information I need for quick reference. My annual Holiday Stamp a Stack is scheduled for Sunday, November 6. If you live in the Metrto Vancouver (Vancouver, Burnaby, Richmond, North Vancouver, West Vancouver, Coquitlam, Surrey, New Westminjster, Langley) area and would like to attend, please join us. There will be prizes and a candy bar! Email me for registration particulars. Do you dream of a White Christmas? I can offer you a different type of white Christmas with my White Christmas card tutorial featuring four cards each with a unique element and using the various envelope sizes offered by Stampin' Up! together with some of the wonderful Big Shot tools that make it so easy to create the cards. The tutorial will be sent to you in PDF format within 24 - 48 hours of purchase and completion of payment. Another great promotion from Stampin' Up! for October. Enjoy the ease of creating your cards with a Simply Sent kit. For the month of October, if you purchase two Simply Sent kits, you will receive a free stamp set to co-ordinate with your kit. The Everyday Wishes set is ideal to assist you with some quick Christmas cards, the Great Day kit is so handy for special occasions like birthdays and the Sweet Moments to celebrate those special sweet moments. With a little click HERE you can order your kits in time for Christmas or any other special occasion. My friend Pam sent me this anniversary card she made and it is so adorable. She used Certainly Celery as the base card stock. After punching out a circle she inserted a piece of Whisper White that had been textured with the Square Lattice Embossing Folder. The owls are Early Espresso. She blinged it up with some rhinestone accents. Thanks for stopping by and happy stamping. I just love the leaves in the Autumn Splendor stamp set (p. 115, 116503, $25.95). The set was introduced before clear mount stamps so it only comes in wood. It's my standby stamp set for this time of year and also for masculline cards. I recently made this card for my SIL's birthday. Mounted on the black card stock, is a panel of Crumb Cake layered with the Mocha Morning Specialty Designer Paper. The leaf is stamped with Black Staz-On on a piece of Crumb Cake. After cutting it out, the leaf was sponged with Soft Suede to pick up the color from the Mocha Morning DSP. Add some dimensionals on the back of the leaf and place it on the panel. This is where those edges from your sheet of dimensionals come in handy as you just need some small strips on the leaves so that it is nicely mounted on the card. The greeting from Upsy Daisy is stamped with Black Staz-On on Crumb Cake and punched with the Decorative Label Punch. The black mat are two punched pieces using the Decorative Label Punch. One is cut horizontally to give i the mat on the top and bottom and the other is cut vertically to complete the mat on the ends. Snip off the tiny ends so that they do not show in the front. Whenever you feel like shopping for your stamp supplies - it's as easy as a click of the mouse right HERE. As we celebrate Thanksgiving in Canada, I wish you all a Happy Thanksgiving. Thanks for stopping by this cold and rainy day - and happy stamping! A Big Deal for a Big Shot! 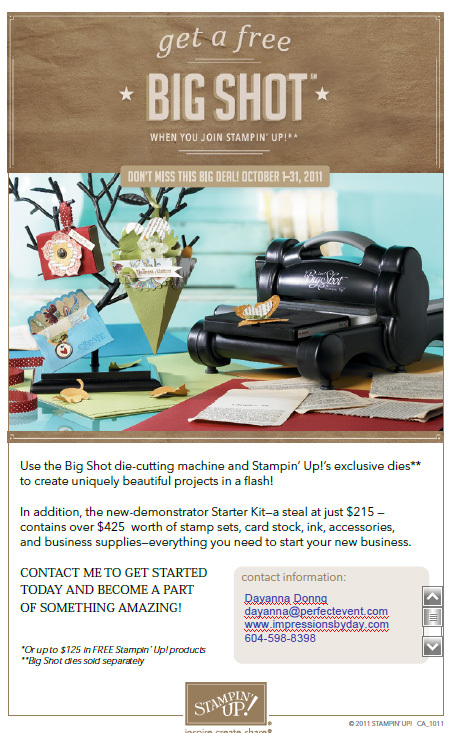 During the month of October, you can receive a FREE BIG SHOT by signing up to be a Stampin' Up! demonstrator. I look forward to you joining my Stampin' Up! team with this great offer from Stampin' Up! - click here for more information. Whether you live in the Metro Vancouver area or across the country in Newfoundland - I've love to have you on my team!